We are at the point in our sale of state charity tickets where all returns must come to Jim Gaylor. We have had good participation from members and with the sale of tickets at the mall. Thank you to everyone who has sold (and bought) tickets. We are on track to surpass our 2016 sales this year. At the State AGM, Grand Knight John Price was given this certificate of recognition for our council’s tickets sales in 2016. For a council of our size, we do very well. Jim Gaylor accepted the certificate on behalf of council members who each year buy and sell these tickets. 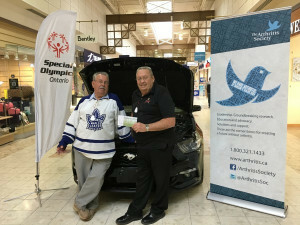 Harry Visser and Edgar Chaput at the mall selling state charity tickets over the Easter weekend. 21 books of tickets were sold over 4 days. Tickets have arrived. Can we match last year’s sales? We will be selling tickets at the Mall from Thursday December 15 to Boxing Day December 26. 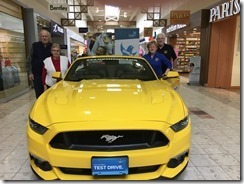 Contact Jim Gaylor (271-3446) if you can spend a 3 h shift at the Mall. Members will be contacted by either Jim Gaylor or Gerry Culligan in the new year to receive their book (books ???) of tickets. However, if anyone wants their normal allotment of tickets before Christmas for stocking stuffers, etc, contact Jim. 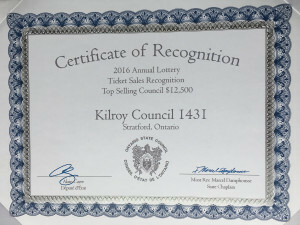 The results from last year’s Charity Lottery draw have arrived. 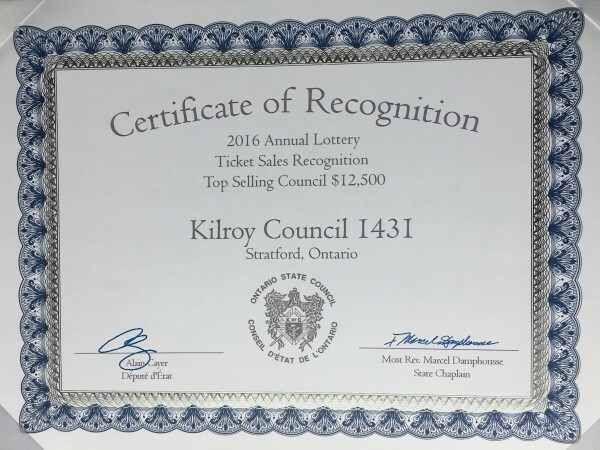 Congratulations to Council 1431 on being in the top 10% per capita of ticket sales in the province. This is a remarkable achievement for us. We have received 20% of our gross ticket sales, $2,502, for our charitable account and $625 for use in our council account. There is a chance that this year’s tickets will be to us before Christmas. Tentative plans have been put in place to sell at the Mall if this occurs. Two winners from Council 1431 sales this year. While there were fewer winners than in the past two years, we hope to receive a boost to our charitable funds from the great effort members made this year to sell tickets. Thank you to everyone who put in a shift (or more) selling the Charity Lottery tickets at the Mall. Between the sales during Valentine’s week and the week of March break, 80 books were sold, ($4000). For those of you who spent 3 h at the mall during the week on ‘slow days’ selling perhaps 2books, it all added up Thank you once again. Please turn in your SOLD tickets and money this month. Thank you to sellers at the mall March 11-20 : Gerry Culligan, Bernie Van Herk, John Saman, Mike Dunn, Jim Miron, Helen Goforth, Dave Nickel, Henry & Mary Sterkenburg, Dave & Joan Franks, Tom & Louise Gould, Jim & Elvira Gaylor, Frank & Mary Nyenhuis, Harry Visser, Edgar Chaput, Fred Dubrick, Larry McCabe, Ken Gaffney, Ron Marcy, Shawn Raiman, John Bettridge, Paul Smith, Joe Lynett, Lorne Johnston, Lorne & Sharon Twamley. 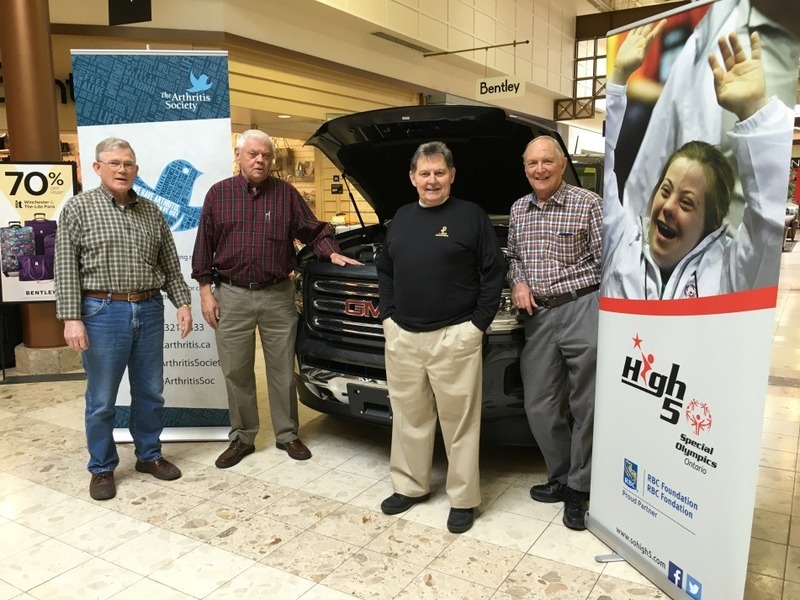 Gerry Culligan, Mike Dunn, Dave Nickel and John Saman persuade mall shoppers that two for $10 is a better deal than one for $5. 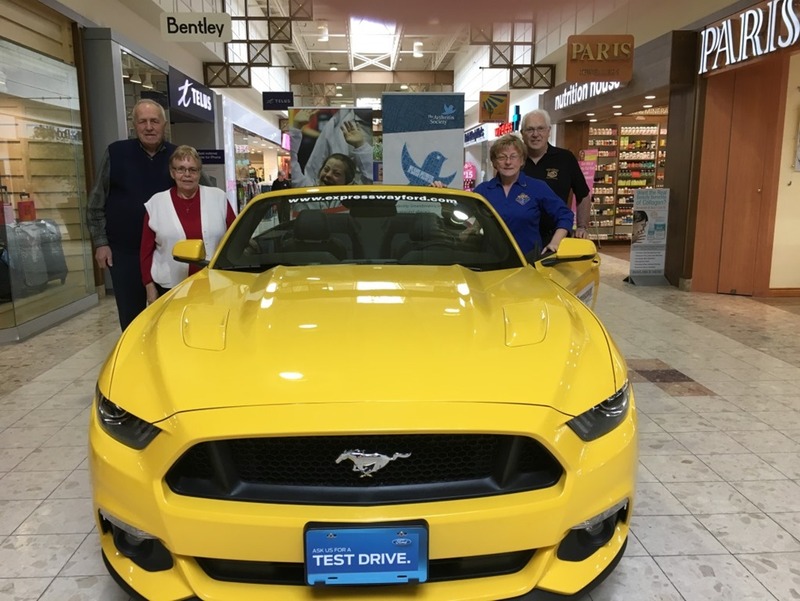 Thank you to sellers at the mall the week of February 8: Gerry Culligan, Bernie Van Herk, Jim Hurley, John Saman, Mike Dunn, Jim Miron, Dave Nickel, Bill Mullin, Paul Zybura, Henry & Mary Sterkenburg, Dave & Joan Franks, Tom & Louise Gould, Jim & Elvira Gaylor, Frank & Catherine Flood, Mike & Patty O’Donovan, Frank & Mary Nyenhuis, Jane Larkworthy, Harry Visser, Edgar Chaput, Fred Dubrick, Larry McCabe. You Have Been Anxiously Awaiting !! The Tickets Are Here. With Share the Wealth tickets not sold this year, Council needs to find ways to raise monies for our charitable giving. Sale of these tickets is one way we can do this. Please consider selling/buying this year. 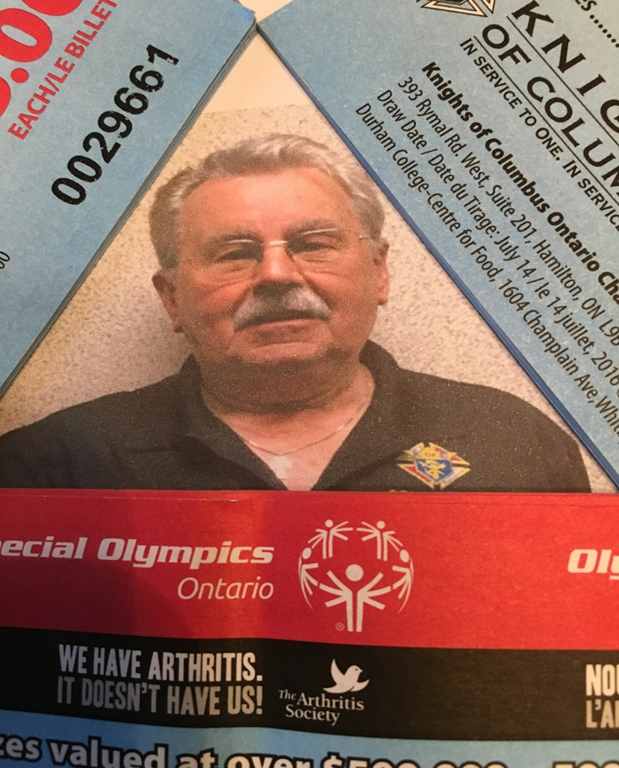 Proceeds support the Arthritis Society and Special Olympics. It is with considerable disappointment that Br. Jim announces that the State Charity Lottery tickets will not be available until January. Many of you use these tickets as ‘stocking stuffers’ and we are missing a glorious chance to sell at the Mall. It’s out of our hands Brothers. Charity lottery tickets will be available before Christmas. Remember there are no Share the Wealth tickets this year. The Charity lottery could be a stocking stuffer. 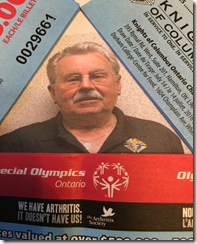 Operating for over 40 years, the Ontario Knights of Columbus Charity Raffle or as it is now known the “Charities Lottery”, has been supporting the Arthritis Society, helping to fund research to cure this horrible and debilitating condition. This past year’s lottery also supported Special Olympics Ontario to help promote a healthy and active lifestyle through sport to improve the wellbeing of individuals with an intellectual disability. Our support exemplifies our commitment to the dignity of every person and our dedication to assisting with our neighbour’s needs, whatever they may be. In a few months we will again be asking for your help to sell/buy Charity Lottery tickets. Brother Jim is already making plans to sell more tickets this year.